Welcome to the gate of the professional world of teaching! Before you enter it, you must first overcome a significant challenge which all the professional teachers took — The Licensure Examination for Teachers (LET). If you are now preparing for the reviews, there is one thing you should make sure of— and that is to have an idea of the context of the exam for you to set your perspective to begin your review. 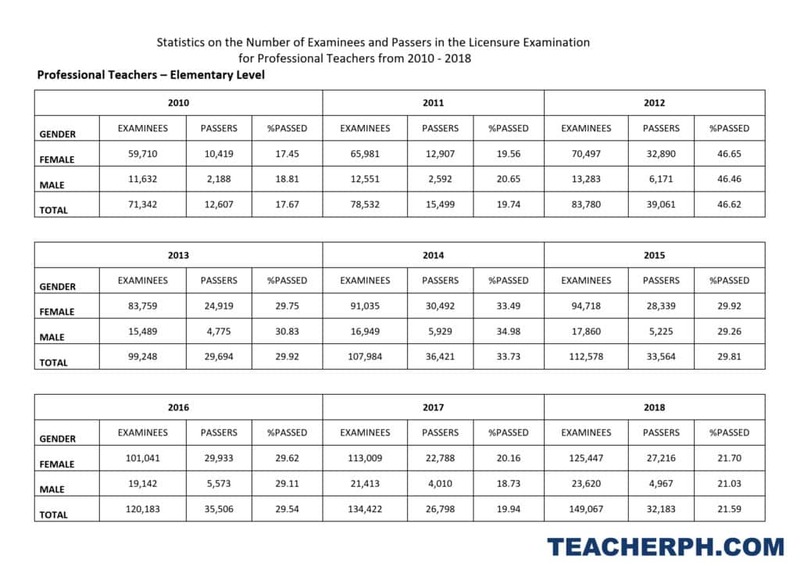 An article published by Rappler Philippines in March 2014 states that most schools for teachers perform poorly in the licensure exam according to PBED (Philippine Business for Education). Their recent study showed that most teacher education institution had not reached the national test-taker passing rates. Because of this, they provided the public the list of low-performing schools to make sure that parents will have an idea what kind of school they are sending their children to. Teacher Education Institution is accountable to provide better education but sadly, in most cases, the standards of quality education are not being met, and the students do not get what they deserve. That is why when it comes to taking the Licensure Examination, only half of the test takers and sometimes less than half pass. 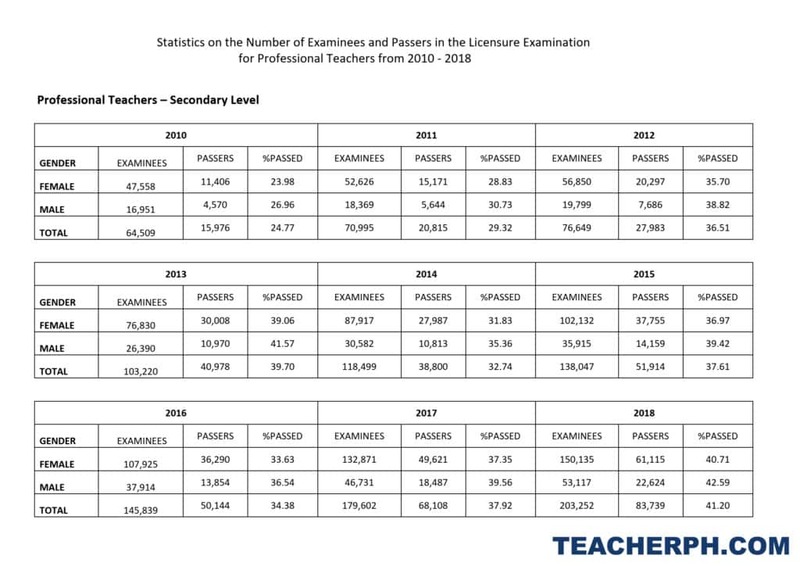 Below is the statistical table of examinees for elementary and secondary level in the last eight (8) years (data requested via FOI). Now, though your school is not in the list of low-performing schools, you should not be too confident that you will pass the LET as there are still things you didn’t learn in college that will be included in the content of the exam. It is also important to consider the factors as to why most takers fail the Licensure Examination for Teachers. We have enumerated the top reasons below. However, these reasons should never be an excuse for exam failure. These reasons are just emphasized for the consciousness of test takers and also to charge them to work towards avoiding them. It is a habit. If you continue to do just nothing, you will achieve noting. It is probably the biggest reason why so many test takers fail. They feel too confident exceptionally when they know they performed well in their subjects during the college years, and they’d rather spend time working or having some merriment. Success on the exam doesn’t work like magic; it involves hard work and diligence. You must be missing the essential part of your review. Reading has been proven to enhance one’s memory effectively and brain function, so it is recommended that before you take a major exam, you get used to reading a lot of months before it as it also helps you understand faster. Remember that some parts of the test require reading passages that are quite long so better have an early practice than feel sorry about failing the exam. Some test takers are so confident of themselves that it leads them to underperformance. They don’t see those little things that count. While confidence is a good thing, having so much of it can be dangerous. It is not guaranteed that when you have an idea about a particular topic, you will surely know everything about it. It is not a waste of time to know too much about one area. A single topic might seem simple but don’t be assured that you don’t need it. Over-confidence can harm you. It has happened many times that some test takers encountered an item/items in the test that were not introduced to them back in college. Well, sadly, you don’t learn everything you have to know in college as some professors sometimes miss some essential parts of the subject(s) they teach. That is why enrolling in a review program is recommended before taking the test. What you think becomes what you are. Do not ever think of coming out of a plan A or a plan B if ever you are going to fail the exam. Your only goal is to pass the exam. That’s it. Do not think about failing. Instead, spend your time to make sure you of passing. Time spent worrying must be spent reviewing. Test-takers must have a clear mindset. Everything in life lies in mind. If you want to be a professional teacher, which will give you a lot of benefits, you must commit yourself to pass it. Yes, you may be having fun working and earning now that you have finished college, but you must know that there’s more to it. You will eventually get more enjoyment when you are already licensed! Yes, money can be one of the reasons. Sometimes, test-taker can’t just afford to buy material that will help them enhance exam success. Right food, quality review materials, and gadgets can make studying more comfortable, but because of the lack of budget, chances of passing is compromised.